Balloons, books and TopGun: Episode 128 is live! Grant’s pulled out a big collection of ballooning interviews including discussions with military & commercial fixed wing pilots who enjoy the challenge of flying hot air balloons. 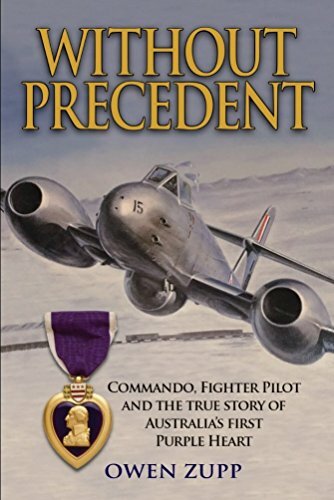 We’ve also got a fun chat with Owen Zupp about his new book: Without Precedent, our tribute to Hannes Arch and the Infrequent Flyer finally gets to see TopGun (in 3D at the IMAX, no less). This is our biggest episode ever (even bigger than Episode 51’s “Farewell to the Pig” tribute to the RAAF’s F-111s. From Grant’s collection of ballooning interviews to a chat with Owen Zupp about his latest book and our tribute to Hannes Arch, this episode is our biggest yet (yes, even bigger than Episode 51, our tribute to the RAAF’s F-111s!). We’ve even captured Anthony “The Infrequent Flyer” Simmons’ first ever viewing of the movie TopGun (in IMAX 3D no less :) ). 00:00:00 – Our tribute to Hannes Arch, the Red Bull Air Race champion pilot who tragically died in a helicopter crash in September, 2016. 00:04:54 – Show start & introduction. 00:14:12 – We talk with Owen Zupp about his new book: Without Precedent. It’s the biography of his father that covers his time as a commando in World War 2, flying Meteors during the Korean War, flying Constellations with QANTAS and later flying in General Aviation. It’s a fantastic read and highly recommended. 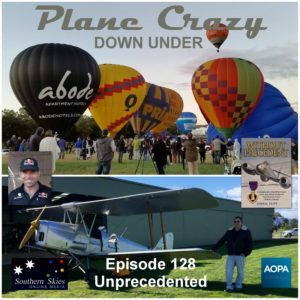 We started by discussing Steve’s recent Tiger Moth flight with Vintage Airways at Lilydale and how much fun he had finally flying an aircraft he swore he’d never go in. 01:05:22 – Grant talked with Phil Kavanagh back in 2013 about the early days of sport ballooning in Australia in the 60’s & 70’s, manufacturing balloons in Australia, teaching themselves to fly, setting up Kavanagh Balloons, sourcing materials, new developments and the future of ballooning technology. 01:27:09 – After talking to Phil, Grant caught up with Sean Kavanagh about his career in aviation ranging from being an aircraft engineer with QANTAS through to flying & making hot air balloons. Sean has flown in competitions and also been a commercial pilot flying at various locations around Australia, including the challenging city of Melbourne. In 2013 Sean was designing new balloons and burners for the company, including producing the inevitable paperwork and dealing with the Civil Aviation Safety Authority (CASA). We also discuss in some detail the effort that has gone into designing the new Series IV Crossfire burner. John Wallington is the Flight Director of the Canberra Balloon Spectacular, an annual event which has been running since the 80’s. He talked with Grant in 2015 about the experience of flying over Canberra and keeping the flying side of the event running smoothly and safely. 01:55:37 – Don Whitford is the meteorologist of choice for ballooning events in Australia and he spoke with Grant about his career of more than 40 years in aviation weather forecasting. They also talk about the impacts of the changing weather patterns that are being experienced recently. 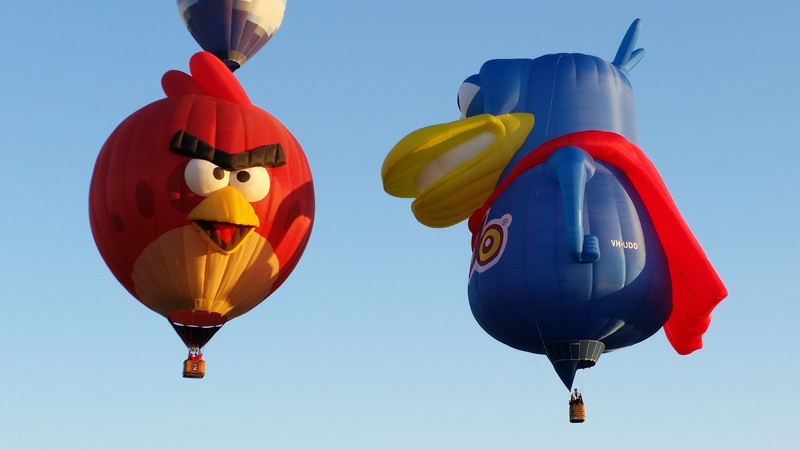 02:05:06 – Frank Wechter was at Canberra flying the Angry Birds special shape balloon. 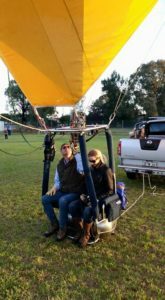 02:06:53 – SQNLDR Damien Gilchrist used to be with the RNZAF flying Strikemasters, Macchi 339s and A-4 Skyhawks before transferring to the RAAF about fifteen years ago and in 2015 & 2016 was the primary pilot of the RAAF hot air balloon. 02:10:33 – Richard Turnbull is back from the UK flying for commercial operators around Australia and returns to the show to briefly talk about what he’s been up to lately. 02:12:56 – Grant chats with Ruth Wilson, Australia’s first female commercial hot air balloon pilot who has been flying balloons for over 40 years and also has a fixed wing license. She was also the first Australian hot air balloon champion and represented Australia at events around the world. 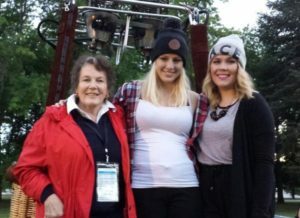 They talk about flying over Canberra and being involved in the Women Fly It Forward event by taking young ladies for their first flights. 02:17:01 – Grant flew with Kevin Cooper in his Thunder & Colt Chariot balloon which is essentially a two seat chair lift hanging under a small balloon that is a LOT of fun to fly. They also talk about his career flying balloons around the world and the experience of flying over Canberra. 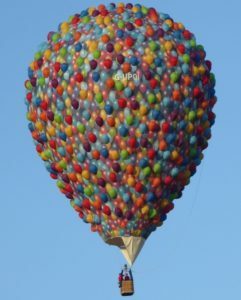 Cameron’s “UP” Balloon was designed to look like a collection of small helium balloons. Jeff Vella is an ex-RAAF pilot who currently flies airliners for Cathay Pacific and is based out of Hong Kong. He’s also one of the pilots flying the RAAF hot air balloon as well as flying the Cathay Pacific hot air balloon. 02:32:58 – Nick Purvis is the Sales Director of Cameron Balloons and he talks with Grant about the “UP” balloon on its “Up Down Under” tour and the new 250kg RAAF special shape balloon. They also talk about building special shape balloons including printing graphics on envelope, the interior gusseting & supports that help to keep the shape and the “dead air” that doesn’t contribute to lift but helps pressurise the shape of the balloon. Nick also gives us a quick history of the Cameron Balloon company. 02:46:05 – SQNLDR Damien Gilchrist returns to talk about flying the new RAAF special shape hot air balloon. 02:49:24 – Grant, Ms Kitt and Steven Pam took Anthony “the Infrequent Flyer” Simmons to see TopGun in 3D at the giant IMAX cinema in Melbourne. They chat about their expectations before going into the cinema and then perform a debrief after the movie. We’ve got the need, the need for speed! Oh my! 03:04:06 – Steve & Grant wrap up the episode and discuss Grant’s recent commentary at the Wings Over Macleay air show at Kempsey in New South Wales plus the upcoming Angel Flight charity event at Lake Macquarie on November 6th with Matt Hall, OzRunways and AOPA. Steve will be MC for the event and Steven Pam will be there shooting stills and video. The boys also discuss how Steve’s trying to get used to flying a Cessna with a glass cockpit along with how Steve recently dobbed Kathy Mexted in as a guest host for the Plane Talking UK show. Finally, Grant’s getting his notes ready to do the commentary for OzKosh at Narromine. It’s all go especially as Steve’s getting ready to move into a new house that’s almost finished being built and will include a cool new studio for future recording. Kevin Cooper about to take a friend for a flight in his Chariot. Ruth Wilson took two young ladies up for their first flights as part of Women Fly it Forward.